Research Matters is an annual event that encourages graduate students to give a "Ted Talk" style speech about their research. 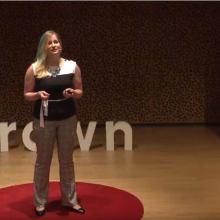 This year, Jess Steveson, a PhD candidate in Neuroscience, discussed how minibrains can be used as a model for brain injry. The Warren Alpert Medical School of Brown University and the Lifespan Health System announced the recruitment of Wafik El-Deiry, MD, PhD, FACP, an internationally recognized physician-scientist, academic leader, and medical oncologist. Warren Alpert Medical School's comprehensive four-year curriculum that focuses on overdose treatment and preventative measures received the Curricular Innovation Award from the Association of American Medical Colleges.